Saturday, June 13. The conductor's compensation that morning was my pounding head and churning stomach. But we can't stop halfway to our destination. We headed out to the Official Campground Vending area. "Shakedown Street". 3rd and Third, represent. The Solar Cafe set up a sun-powered stage and Sol Driven Train, a quintet from Charleston, SC had an afternoon show to put on. Russ Clark (sax, vocs), Ward Buckheister (guitar, trombone, vocs), Rusty Cole (bass, voc), Joel Timmons (guitar, vocs, Space Helmet) and Wes Powers (drums, Fleetwood Mac shirt) propelled their Train with manic energy and chugging rhythms. They switched instruments in the middle of songs and at one point left the stage to play anything in the area that they could hit with a stick- tent poles, plastic bottles, logs, you name it. There were a capella breakdowns/freak-outs during their original tunes The Cave (about a bar in Chapel Hill) and Long Johns(about the underwear). Remember the Meow Mix jingle? Meow-meow-meow-meow ...don't let it get stuck in your head ... they did that too. The set also included great covers of Late In The Evening, Ground Control To Major Tom (where Joel donned his Helmet at just the right time) and Toto's Africa. Even though Shakedown was more on my wavelength and there were lots of old Vendor friends around, I headed back to the overly diversified lineup and commercialized vibe of Centeroo. I got to hear Booker T, backed by the DBT's instead of the MGs, play Green Onions. I should have checked the schedule, because I don't know how I missed Rodrigo y Gabriela. I was at The Compound listening to the Tony Rice Unit, again with diminished clarity due to our location. That's the compromise when you can chill in a hammock instead of trying to cram under the shade with a thousand plus people. I did drag myself over to This Tent for Of Montreal. With giant feathery wings, animal mimes, human statues and glitter galore they poured on the pomp. Their songs were hit-or-miss for me, but their sing-along choruses and psychedelic textures drew the biggest daytime crowd I had seen at This Tent. With NIN, moe. and MGMT set to do late-night sets starting at 1am and due to my ambivalence toward anything on the schedule, I went back to the chill spot. I was awakened, a little earlier than I planned to get up, with news that a Festival Taxi was waiting to take us to see The Boss. Go with the phlow; and let the beer phlow too! We walked in on some banter about 'Sexual Healin g'. I told myself that I was going to be open-minded about the show. Bruce Springsteen is a living legend and he still puts on a powerful show. During Youngstown I thought the veins on his neck were going to explode. I BELIEVED that he was a laid-off steel worker. I also told myself I wouldn't get too into the show, either, but I can tell you I came up for The Rising. When he gathered up request signs from the audience and pulled Santa Claus Is Coming To Town I couldn't believe he had the huevos to play it. "It's too hot for Santa!" While on the subject of The Boss's junk, there was the obligatory backwards-knee-lean with-crotch-in-mic-stand move, brought to us in close-up on both of the giant video screens that flanked the stage. The cameraman lingered there a little past the point of humor/comfort. Thunder Road was played while the home-made cardboard sign requesting it was displayed on the stage. The same for Born To Run. Glory Days came toward the end, causing some introspection as well as being a harbinger for things to come. "You can't take no more! You're all Bonnaroo'd out." You might want to watch how you set up those double entendres, there, Boss. Some of the crowd didn't want no more, and not everybody was chanting "Bruuuuce" it just sounded like that. I thought Bruce was a little out of place in the lineup, but no more so than some of the Headliner head-scratchers in past years. I enjoyed the show way more than I was going to allow myself to admit. Even when he pulled the girl with the 80's hair and Jersey sweatshirt (Courtney Cox she wasn't) up on stage for Dancing In The Dark. I checked out a little moe. and as always they rocked out while being insanely mellow. I was flying by the Seat Of My Pants and tried to go over to Nine Inch Nails but the Closer I got the scarier the lights were. I found a spot between the stages, very close to that phallic fountain, where I could hear either band I focused on but where the very different vibes wouldn't envelope me. I know now why I couldn't get totally into these shows. The Campground was calling me. I made the hike and arrived to find Zack Deputy playing his twentieth set of the weekend. The Zack Shack was set up right beside a hay trailer and, believe me; we had ourselves a hoe-down. Zack layered some trance-swamp chicken pickin' over his looped Island rhythms while everyone danced ecstatically. Jell-O shots kept magically appearing in my hand as the sun suggested that I call it a night. I have to see at least one sunrise at Bonnaroo. Sunday! Sunday! Sunday! No Monster Trucks, but there was all-day Metal Mayhem at That Tent. As much as I heard about Dillinger Escape Plan and their violent shows and as enticing as the band name High On Fire was, I didn't go anywhere near that scene. In fact I didn't enter Centeroo at all until it was time for Phish to close out the festival. I spent the afternoon turning folks on to Home Grown Music Network by handing out catalogs to those who were receptive. It's a tough life, drinking beer and talking about music with random passers-by, but I do it, once again, because I love you. I do wish I'd checked out some Merle Haggard. He was in the same strata as Al Green, Allen Toussaint, and Booker T; legendary performers who might not be making music much longer so this might have been my last chance to see them. Oh, well. Fashionably late for Phish again, we walked in to the "I'll show you mine if you show me yours" lyric from AC/DC Bag. With NICU and Gotta Jibboo, two of my favorite songs to dance to, up next, mine was hangin' out for all to see. PYITE again. With the same 'here we go again' look on Mike's face when it was his cue to do the little shuffle. Sparkle and Bathtub Gin were fun. I was weaving my way to the Urine Wall (the porta-potties were right there but they were for VIP's only so a bunch of guys created their own cesspool in protest) when they played Character Zero. They reminded me again to 'take it slow' and I slipped in the elitist bathroom facilities when Security was preoccupied. I can pee in front of tens of thousands of people if need be but I had nothing to prove. Tweezer was gritty but not as funky as usual. The Horse-Silent In The Morning brought things down at a time I deemed inappropriate. This exact thing did not happen to me just last year. Run Like An Antelope didn't hit high gear, either. When Trey started his speech about seeing a show that changed his life and his perception of what live music should be like I knew who was about to join them. Bruuuuuce. Mustang Sally. Ride, Sally, ride. 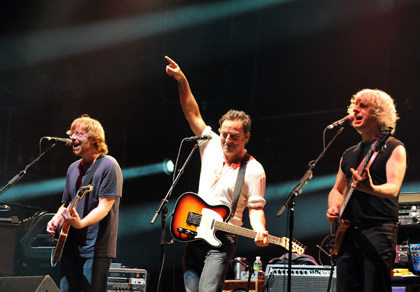 It was a lot of fun, and Bruce traded a few licks with Trey. They also played Bobby Jean which I don't remember anything about. Glory Days, just as thought-provoking as it was the night before, closed out the first set. The lights came on so bright that it seemed like that was the end of the music. If my Bonnaroo had ended like that I might have been done with festivals this size for good. My soul was saved by Rock And Roll. I threw on my golden cape. Time to be a superhero to the visually starved again. 46 Days rocked out with a strange limp. During Limb By Limb I was having one of those quasi-mystical conversations about those things that people like us don't have to say to each other. I noted this bit of synchronicity because I always thought the imagery of the lyrics had some basis in shamanic lore and pointed that out before we decided to leave words behind again. Prince Caspian was the most memorable song from that point on. Well, everyone did chant "Suzy-SuzySuzy-Suzy-Suzy Greenberg" during the encore tune named after that talented yet neurotic young lady. I caught a golf cart ride out to Third and Third, where It was all happening. Surprise, surprise, Zack Deputy was doing another set. I think he slept behind his instruments and just played whenever he woke up. And though it was no surprise at this point, Giant Panda Guerilla Dub Squad was the last band I got down to. More like I swam through the heaviness they laid down before saying goodbye so I could be ready to pack up and journey home. It was an epic adventure and my words can never do it justice. Phish can still do what they do. Bonnaroo has not quite gotten too big for its britches and you can always find the spirit of the 'Roo if you follow your bliss and all that hippie jive.